Traditionally this healthy Eight-Treasure Porridge is eaten on the Laba Festival, the eighth day of the La Month (i.e. the twelfth month of the Chinese lunar calendar). As for myself, I love to eat it whenever I like throughout the year. Well, if you’re living in an area where it’s cold, this dessert soup is a good treat warming yourself up, as well as absolutely guilt-free. The ingredients used are nutrient-rich, good to our body. Chinese Yam can help lower blood sugar and blood pressure, sooth mood and get better sleep. Best of all, it’s very easy to make. Simply soak and wash the ingredients, then pop them in a large pot. There you go. All you need is to put all the ingredients into a large pot. Simmer until all ingredients become tender. There you go. Soak the red beans over night, or at least 3 hours. As for black glutinous rice, mung beans, peanuts, lotus seeds and pearl barley, soak for 1 hour. Drain the soaked ingredients well. Set aside. Place 2 liters of water into the inner pot of a thermal cooker. Put in all ingredients, except the Chinese yam and dried longan. After bringing it to a boil, cook further 15 minutes. Transfer the inner pot inside the cooker, covered and let it sit for 1 hour. If not using a thermal cooker, you can use a regular deep pot instead. After it boils, reduce heat to low and cook for about 1½ hours until all ingredients are softened. Occasionally stir to prevent from sticking to bottom. Peel and cut the Chinese yam into dices. Remember to put on a pair of gloves as its sticky juice might cause skin allergy. Take the inner pot out from the thermal cooker. Add the Chinese yam and dried longan. Cook on stove until the yam is softened, about 20 minutes. Add rock sugar and cook until the sugar is dissolved. Done. Serve hot. What I love to use my thermal cooker is saving time and energy as it doesn’t need a power cord or constant stove heat. The ingredients used in making this dish are very flexible. You can adjust the amount of each ingredient according to your preference. If you don’t use a thermal cooker, a heavy-based deep pot can be used instead. The power of every stove is very different. Be sure that there’s enough water inside. Replenish some boiling water if needed. Chinese yam is available at Asian grocers. So nutritious and delicious! I would love one large bowl now for the lunch. It's a big hit for our gatherings too. Yes, indeed. Thanks for dropping by. Thanks Christine, your recipe and guidance are great! Simple and detailed. 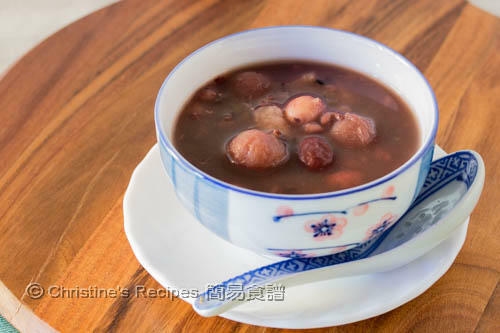 I have tried it last night and this morning I have such a tasty dessert 'Thong sui'. This recipe is sure my keeper. Muaks! Glad that you liked it. Happy cooking ! Christine, is Chinese yam a necessary ingredient? Can I not put yam? This recipe is very forgiving. You can skip it if you can't find any. But if you have any chance to get a chinese yam, give it a go. It's so nutritious. Can you use instant pot for this dish to save cooking time? Sure, you can. IP saves you plenty of cooking time. I want to cook this but worried abt the lotus seeds. will the seeds be softened finally. 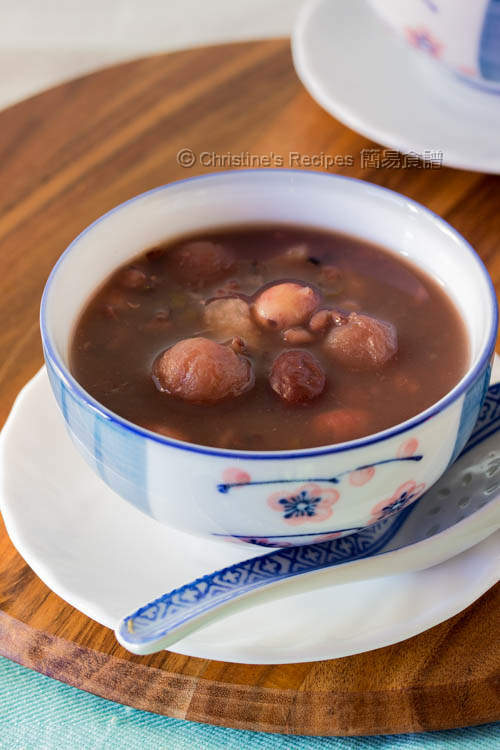 I cooked red bean soup with lotus seeds but the seeds were hard even after being in the slow cooker overnight. I'm a little confused.....the recipe says to add all ingredients except Chinese Yam....then later on, to add Chinese Yam and dried longan. When exactly should the dried longan be added? Sorry for the confusion. I've updated the recipe. 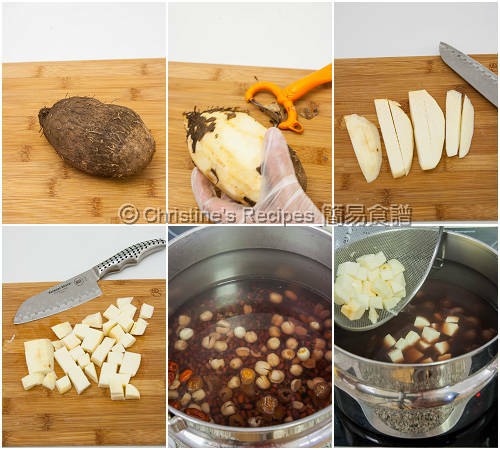 The dried longan and Chinese yam are added together, and cook on stove. By doing this, you can easily control the cooking time and retain some texture.